Funny how sometimes even experts miss clues and facts that they should have been aware of. Such mistakes could be fatal and cannot be easily undone. Imagine if the experts didn’t take a look at this newly discovered Botticelli painting and missed all the clues and continue to regard the painting as a fake. First, the fact that the painting is another version of another Botticelli painting likely have contributed to the confusion. The two paintings are of the same theme: The Madonna of the Pomegranate, at the time the painting was still regarded as a fake, as its “real” sister was sitting in display at the Uffizi Gallery in Florence. Second, the painting was poorly maintained. Before the restoration efforts, the painting looked rusty and dulled due to the thick varnishing that covered the whole painting. When you look at it, it clearly isn’t as good as its twin sister. The third is that people thought Botticelli was all alone and slaving away in his workshop where he painted. In reality, just like most artists of his days, he was running a business and had a studio where people and other artists worked for him. The likely scenario is that he paints, his workers imitates it, he pays those workers, and sell off the paintings. And so it was that such a copy of the Madonna of the Pomegranate made its way to the English Heritage conservators’ studio for restoration, and what they saw after peeling off the varnish astounded them. At first, they were very unsure if this was actually a Botticelli or something that came out of his workshop or if it was just a poor imitation altogether. So they spent two years investigating the matter and finally made the decision that the work was a Botticelli or, more likely, a certified copy that came out of his workshop. “Stylistically it was too similar to be an imitation,” said Rachel Turnbull, the senior collections conservator for English Heritage. They also checked the materials used on the painting as well as doing an x-ray scan that revealed under-drawings underneath the painting. The painting was bought in 1897 by Julius Wernher, a wealthy diamonds trader, and hid it away with his collection at his villa in Greenwich. Botticelli, whose first name is Alessandro, is one of the Old Masters. He was a student of the Filippo Lippi, and was said to be an influential person during his time, Botticelli is also known for painting two more other masterpieces: the Birth of Venus and La Primavera. Though he was an important figure of his time, Botticelli was forgotten and was only rediscovered in the 1800s. He lived from 1445 to 1510 and was part of the quattrocento list of Old Masters, which includes his student Filippino Lippi (son of Filippo Lippi), Michaelangelo, Leonardo Da Vinci, and Raphael. Apart from Filippino Lippi, he also had other students like Bartolommeo di Giovanni and Jacopo del Sellaio. If he was influential and had students, and that he is deemed good enough to teach even his master’s son, then it can be possible that Botticelli was likely running either a business or a school with other artists who could have created the “fake” Madonna of the Pomegranate. A student is a more likely suspect because the painting is imitating Botticelli’s style, though it was never mentioned anywhere that he had a busy studio with lots of people working or studying under his management and the only notable students that he had were the ones who became Masters themselves. 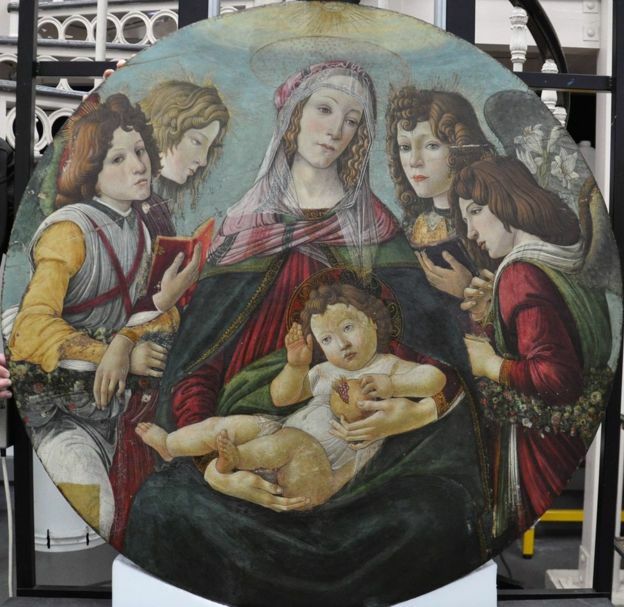 1st image: The “fake” Madonna of the Pomegranate Botticelli, via BBC. 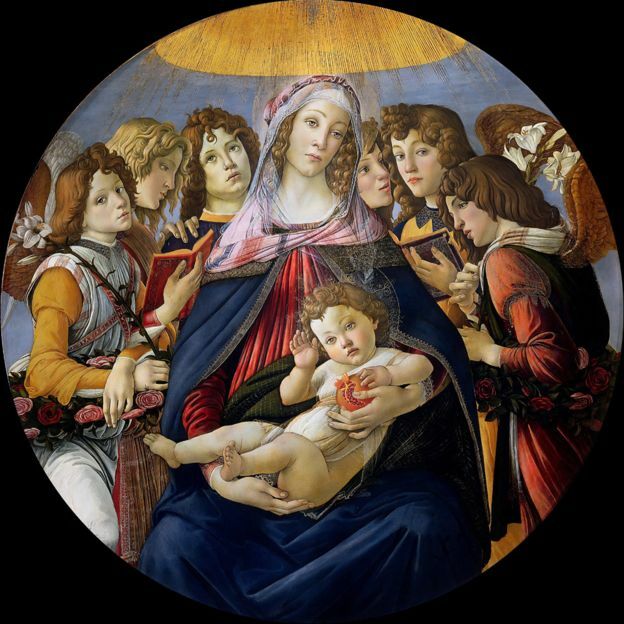 2nd image: The Madonna of the Pomegranate Botticelli, via BBC.